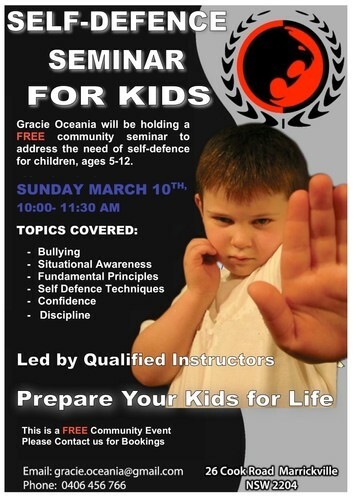 Gracie Oceania will be holding a free community seminar to address the need of self-defence for kids, ages 5-12. The seminar will be led by experienced and qualified instructors, and aims to empower both parents and children to confidently address troubling personal safety issues in a fun, safe and cooperative environment. For more information or bookings, contact Gracie Oceania on gracie.oceania@gmail.com or 0406 456 766.